The media refuses to discuss its rampant violence. Donald Trump’s repulsive off-the-cuff remarks placing equal blame on both sides in Charlottesville's weekend of chaos will haunt his presidency as long as it continues. Regardless of what the President said, there were no “fine” people among the white nationalist and neo-Nazi demonstrators in Charlottesville. Mitt Romney even felt obliged to weigh in to protect the GOP brand, tweeting that the people who came out to oppose the demonstrations were in a morally different universe. While the former Republican presidential nominee did the right thing in making this moral distinction, his tweet didn't tell the whole story about anti-Trump demonstrators in general. While some are dedicated to peaceful protest, there's a dark underbelly that's not inhabiting that shining universe Romney referred to. Antifa (short for Anti-Fascist Action) is a phenomenon that the MSM has never paid much attention to. It's a secretive, loosely-knit organization with no central leadership that harkens back to pre-WWII Europe when militant leftists fought fascists in the streets. 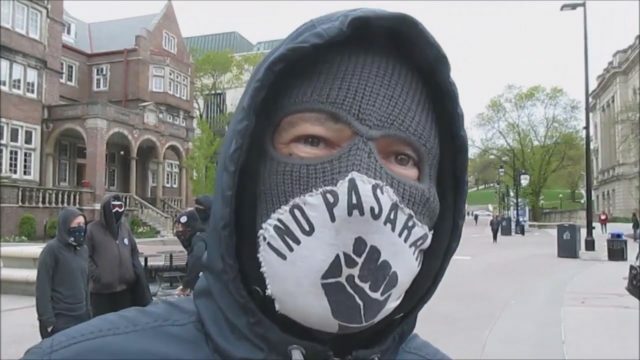 Antifa members wish to remain anonymous, so they often disguise their faces with bandanas or masks when they're at a public event. The media’s intent on telling a black and white story—Trump and his supporters are bad and The Resistance is good. Because Antifa militants oppose Trump, the MSM has assigned them the “good guy” role and glosses over coverage of their frequent violence. These frequently thuggish sorts were in that sleepy Virginia town to wage holy battle in the streets with the white nationalists, neo-Nazis, and KKK. They’d have us believe they're front-line crusaders in the fight to save the U.S. from descending into an ethnostate dictatorship, but a quick look under the hood reveals something much darker. Antifa's chaotic presence in American streets has been skyrocketing since Trump took office, but when I’ve brought the topic up among people who follow the news closely, mostly I get blank stares. That's because the media generally refers to “counter-protesters” when there's opposition in the streets like there was in Washington D.C. on Inauguration Day when police arrested over 200 people. CNN waited until August 15 of this year until it published its first article on Antifa, and the news outfit cares so little about the subject that it assigned the writing task to Jessica Suerth, a student at Walter Cronkite School of Journalism at Arizona State University. It was a puff piece that must’ve pleased Antifa members. Suerth writes that the Antifa are “known for causing damage to property during protests,” and that “members use violence as a means of self-defense and they believe property destruction does not equate to violence,” but offers no examples of this violence outside of a mention of a Molotov cocktail and smashed windows at an event that right-wing provocateur Milo Yiannopoulos was to speak at. Inexplicably, in an article headlined “What is Antifa?,” devoted to a group that openly espouses violence in service of its cause, the writer doesn't mention even one of the many violent acts it's perpetrated. There are too many such acts to list here, but a good place to start would be the case of former college professor and Antifa member Eric Clanton, who got arrested for assault with a deadly weapon after smashing three people in the head with a U-lock bike lock at a pro-Trump demonstration in Berkeley back in April. Those assaults, far from self-defense, were unprovoked. The justification, which is an Antifa standard, was simply that the victims were Trump supporters. The day after a white nationalist in Charlottesville murdered a woman with his car, an Antifa soldier participating in an anti-racism demonstration in Richmond hit a CBS photojournalist in the head with a metal pole, sending him to the hospital, after he’d refused an order to stop filming the event. Antifa people don’t like being recorded, and feel free to back up their orders to stop it with violence. The CBS crew on the scene captured video of another Antifa protester who was concealing a baseball bat. Relying on media outlets like CNN, MSNBC, and The New York Times, you won't learn much about the dark side of The Resistance, but there's plenty of video out there. When Rebel Media activist/journalist Jack Posobiec tried to interview Antifa members in Washington D.C., one of them punched him. In June, multiple people were stabbed at a far-right rally in Sacramento, and police said it was the counter-protesters, which included Antifa Sacramento, who initiated the violence. The MSM has decided that Antifa is the noble opposition to the crypto-fascist Trumpist movement. Jeffrey Goldberg of The Atlantic, ludicrously tweeted, “Watching 'Saving Private Ryan,' a movie about a group of very aggressive alt-left protesters invading a beach without a permit.” That's disrespectful to all the soldiers who made real sacrifices to overcome the Nazis. Sucker punching MAGA-hat-wearing “Nazis” on safe American streets with your face covered up in no way resembles going behind enemy lines after the Normandy invasion. Antifa claims to be about anti-fascism, but ironically its adherents often resemble fascists. The Washington Post published an article headlined, “Who are the antifa?” the day after CNN's Antifa article came out. Adhering to the yarn that the media’s decided to spin, it mentioned not one incident of Antifa violence.